Right away there were so many things special and different about this band review. I had not been to the Cup o Joy's "new" location and was immediately impressed with the stage area, music/light set up, and the rows and rows of seating. When I had called earlier in the day, to get the particulars, I was strongly encouraged to get there as close to the doors opening, at 6:30, as possible. Upon arriving (closer to 7pm) it was evident why, this was important, the entire front floor was filled. One special component of the evening was that I was able to have my 6 year-old daughter join me for the concert. We took seats in the "second-tier" section and watched as chairs were added all the way to the back door and then it was standing room only. The Cup o Joy is a unique treasure not only in Green Bay, but also throughout the music community. Artists come from all over the country to perform on the Cup stage because of its professional yet intimate listening setting. Jill Phillips made a point to mention how few venues there are of this caliber that she has come across in her travels. The Cup o Joy states that it "hosts 'Music That Inspires' in downtown Green Bay in an alcohol/smoke free, family friendly environment." Jill Phillips and her husband, Andy Gullahorn, came out on stage and they immediately engaged the crowd with some personal and career background information. This helped set the tone for the intimate journey they would take us through during the evening. Before each song they would take time to explain inspiration for their songs. 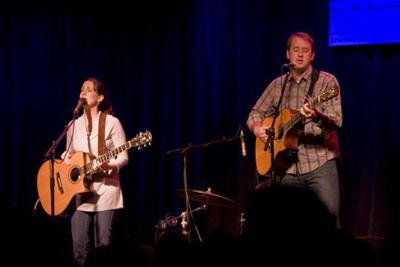 Their opening song, "A Lot Like Me" was off Jill's most recent release, The Good Things, and as she explained prior to singing it is about how our differences are smaller than we realize and "we are all in the same boat sailing on the same old stormy sea." 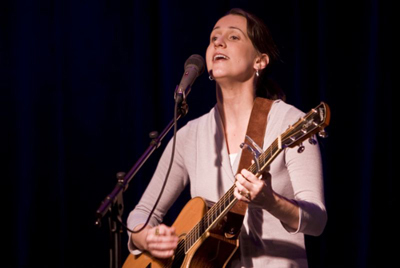 Jill Phillips is a Nashville-based singer-songwriter who, in 1998, got her start in the music business after graduating from Belmont University. Jill was recognized by CCM (Contemporary Christian Music) magazine for independent artist of the year in 2002. She writes her own songs and currently has six solo CDs released taking samplings from each during the concert. Jill's voice is beautifully clear and soothing with the ability to be emotionally strong. Jill and Andy each played acoustic guitars and their harmony was amazing with great rhythm and lyrics. Songs focused on themes of realizing we are not in control and can not and should not think we can do it all on our own, we need to rely on God to lift us up. "Grand Design" from the CD, Writing On The Wall stated this perfectly, Jill explained she wrote this song after her father passed away and suddenly it was time to decide if she truly believed in all she claimed she did. She needed to release sorrow and anger to the point of acceptance and submission. Not everything was so serious there was humor thrown in when Andy sang a song he had dedicated to a good friend about his severed toe; ok you had to be there. The whole evening left me feeling refreshed and at peace. My 6-year-old summed it up by writing, "It is very cool."